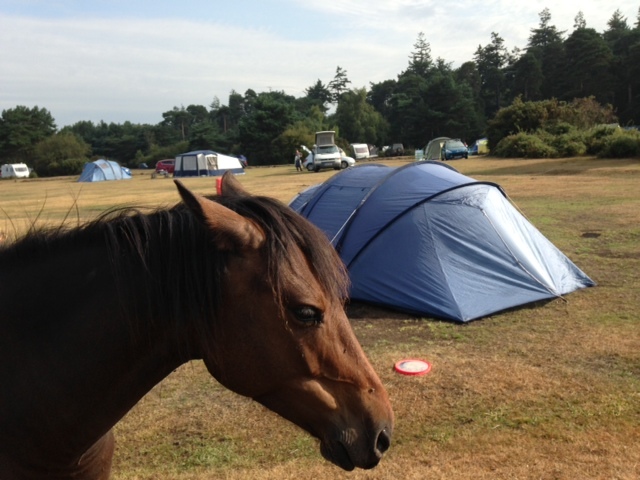 Camping at Roundhill is only a couple of miles away from Brockenhurst, the small town in the heart of the Southern part of the New Forest. It still took us some time to get there. 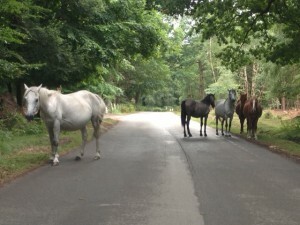 The road was blocked by wild horses who seemed to enjoy the fact that the world has to slow down to their pace. We wait until they decide to move away from the road and let the cars pass. This is a clue to what camping at Roundhill has to offer. It’s a huge expanse of open heathland. 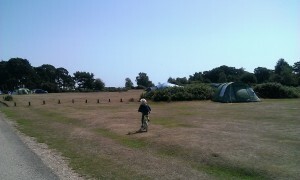 Once an airfield it is now one of the biggest campsites in the New Forest. As soon as you arrive you realise that you are sharing this space with horses, donkeys, cows and pigs who wander at will across the site. Although a large site – up to 2000 people can be catered for during the peak season- the site is so roomy that there is always a quiet corner to make your own and enjoy the experience. Enclosed by forest on all sides, you can’t help to feel you are in the heart of the forest, footpath and cycle paths lead off in all directions, allowing you to roam explore and discover the forest for yourself. There are toilet and shower blocks and various rules and regulations which give comfort to those that don’t want to leave their ordered lives completely behind. Even so camping at Roundhill is worth it. 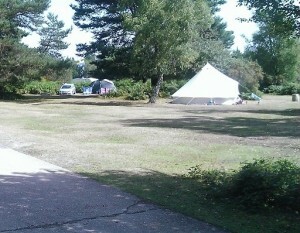 If you want space, tranquillity and an authentic New Forest camping experience this is the place to come. Mind you, make sure you zip up your tent and hide your food away. There are plenty of thieves around… they are the four legged kind with hooves. When they get bored of blocking the roads they tend to get hungry!